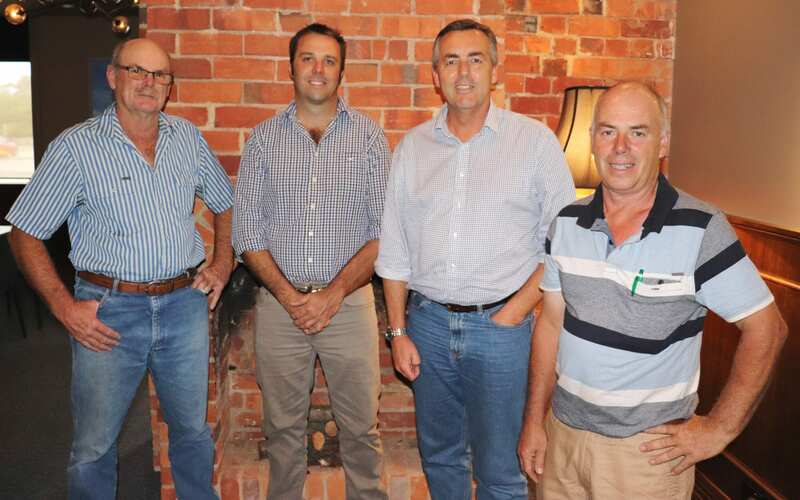 The Federal Member for Gippsland Darren Chester, pictured recently (from left to right) with Geoff Gooch, Angus Zilm and Steve Harrison from the Victorian Farmers Federation, says producers are telling him they just don’t have time to find out what help is available to them. Federal Member for Gippsland Darren Chester has welcomed the launch of an online directory for drought-affected farmers needing help. The website, farmhub.org.au, brings together information on drought support services available from the Commonwealth Government, state and territory governments, charities and other organisations. Mr Chester said it was difficult for farmers to know about all the drought assistance programs available to them and some were unsure how to find out. “Our farmers are spending most of their time ensuring their animals have sufficient food and water,” Mr Chester said. “They are on the phone trying to organise deliveries of fodder and don’t have time to spare to find out about drought assistance programs. Farmers can search the Farm Hub website by state or territory, type of assistance or key word. So far, the Victorian listings include mental health support services, organisations that help with farm finances and household expenses including groceries and school fees, and on-farm grant programs. FarmHub is an Australian Government initiative, administered by the National Farmers Federation. It lists programs available on a national or state level that specifically target farmers. A national map designed to help coordinate the drought response and assist governments, business and communities to make informed decisions has also been launched by Federal Agriculture Minister David Littleproud. The Federal Government is investing $7 billion in new assistance for drought-affected farmers. This includes $3.9 billion for the Future Drought Fund, which from July 2020 will direct $100 million to drought resilience projects each year.